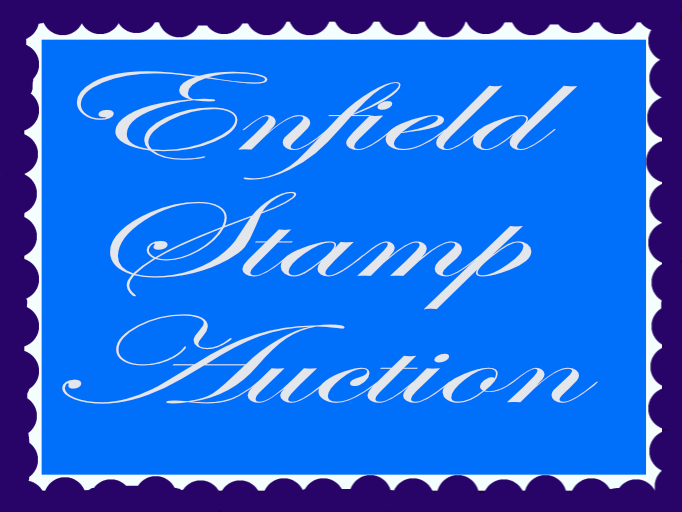 Enfield Stamp Auction 1003 ending 16th Feb...01.02.19 - Enfield Stamp Company Ltd.
Enfield Stamp Auction 1003 Ending 16th Feb.
34 1953-62 1/2c.to $4.80 Defin.set with 1c.shade,M.,good to fine. 55 P.Dues:1890-94 1/2d. dull blue & deep claret,var.three horiz. 87 Express Letter:1931 2Fr.45 myrtle-green,M.,faint hinge mark,fine. 89 1894 10Fr. black & green,U.,parts of two cds.,one corner Perf. 93 1938-53 2s. deep purple & ultra.on grey-blue,chalk surfaced,Perf. 97 1938-53 2s. purple & deep blue on pale blue,ord.paper,M.,fine. 100 1938-53 2s. dull purple & blue on pale blue,Perf.13,M.,HR.,fine. (9/10/40),with bright red frame & deep black head. (1) SG.117var. 170 1967 Decimal Currency opts to $1 & 10s.on 10d. (No 10c.),M.,good. 197 P.Dues:1886-87 1Pi. rose-red,No Wmk.,Perf.10 1/2,UM.bottom marg. 219 1849-52 1Fr. (deep)carmine,Imperf.,U.,light grid Pmk.,huge marg. 226 1929-33 20Fr. deep red-brown,Pont du Gard,Perf.13,U.,cds.,fine. 255 1894 1c.to 5c.,30c. (missing corner Perf.)40c.,75c.,M.,HR.,good. 257 1910 Defin.set to 45c.inscr.”CONGO FRANCAIS GABON”,M.,HR.,45e. 263 1928 Child Welfare set(ex.40c.+40c. ),in blocks of four,UM.,fine. 269 1963 1/2d.to £1 Birds set,UM.,10s.blunt Perfs.at top,others fine. 283 1864 2 1/2s. (deep)blue-green,U.,light cds.Pmks.,four marg.,fine. may have a fake mesh applied to a genuine stamp,sold As Is. 302 1863-64 9k.chestnut,Perf.10,U.,light cds.,suspicion of horiz. 303 1865-68 1k. (very)pale green,Roul.10,U.,light central cds.,fine. 306 Officials:1919 Ovpt’d”Volksstaat Wurttemberg” set,M.,HR.,fine. 355 1908 5c.on 5Pf.to 100c.on 80Pf.Ovpt.set,U.,cds.,fine. 100c. 380 Pl.IA,black,E-F,var.`10 & 7′ Ray flaws,vert.guide line in N.E. II,U.,black M.C.four marg.,close upper-right,good to fine. (1) SG. 393 Red-brown on very blued paper,Q-I,U.,black MC.,four marg.,fine. 407 4d. rose-carmine,Wmk.large Garter,U.,crisp 545 Numeral Pmk.,fine. 421 1s. green,Wmk.spray,Pl.4,U.,central 1872 cds.,left marg.,fine. 422 1s. green,Pl.5,spray Wmk.,U.,Darlington thimble cds.,very fine. 444 1s. dull green,U.,central cds.GOSPORT(complete),good. (1) SG. 464 2d. pale grey-green & scarlet,chalky paper,UM.,top marg.horiz. 540 1 1/2d. dull reddish-purple & bright green,M.,fine. (1) SG.288var. 566 1912-24 1d. scarlet,booklet pane of six,up.Wmk.,M. (1)& UM.,good. 568 1912-24 1 1/2d.red-brown,booklet pane of six,Wmk.up.,M.,Perfs. 581 1924-26 1 1/2d.Booklet pane of four with two labels,CASTELL BROS.
589 1950-52 1d. ultra.,booklet pane of three with three labels,Wmk. piece complete LONDON/E1-E18 Pmk.,fine. (1) As listed in Concise. 602 1935 3s. scarlet,cover,Punch advert,No.316,with one 1 1/2d.& 1d. 628 LESBOS:1912 5Pa.& 1Pi. Stamps of Turkey Ovpt’d T.1,Unused,good. 645 1882-96 10c. deep blue-green,Wmk.CA.,U.,central CANTON cds.,fine. 651 1921-37 2c.to 5c.,8c.orange,12c.,20c.& 50c.,Wmk.Script,M.,fine. 658 1902-04 5k. slate & chestnut,M.,centred slightly to bottom,fine. 668 1940 N.Y.World’s Fair,Ovpt’d 1940,M.,very light hinge mark,fine. small piece one central cds.,fine. Original ptg.for comparison. 692 1911 Arms Ovpt’s,”Relais”(Tehran Local Horse Post),M.,HR.,fine. 736 1879-82 30c. brown,U.,bars Pmk.,good to fine. Not expertised. 748 1922 set to 85c.,Ovpt’d,M.,mixed centring as usual,good to fine. 756 1930 30c.to 5L. Third National Defence set,M.,HR.,good to fine. 816 1999 L.£10,000 Surch.on Papal Visit,U.,large violet cds.,fine. 836 1882-84 5Fr.brown-orange,U.,cds.,irregular Perfs.as issued,good. 838 1933 1 3/4Fr.+ 1 1/2Fr. blue,Child Welfare,U.,central cds.,fine. 854 1848-59 1d. red,latest Impression,worn plate,U.,double ring cds. struck paid in circle Pmk. (RL.T.C14),four close even marg.,fine. 867 1852-63 10c. carmine,Pl.VII,var.Pmk.horn to head,U.,Franco Pmk. 877 1934 1d.+ 1d. “Crusader” Health,horiz.pair showing curious ptg. 881 1895-1900 1/2d.black,Perf.11,Wmk.inverted,block of four,UM.or M.
894 1934 7d. Trans – Tasman Air,M.,tone spots on gum,good appearance. 2d.,6d. (2),1s.& 2/6d.,diff.Perfs.or shades,mixed UM.& M.,fine. 910 1953-58 set to £1 with add.2d.,3d.,6d.,M. (some L.Vals.UM.),fine. 938 1949-53 1 1/2a.to 6a.,12a. Redrawn issue,UM.,12a.M.,good to fine. 964 1864 50r. blue-green,(LUIS),U.,”168″ Numeral Pmk.,four marg. 965 1862-64 100r. dull lilac,Imperf.,U.,four clear even marg.,fine. PORTUGUESE COLS – MOZAMBIQUE CO.
973 1939 President Carmona’s Presidential Tour Ovpt.,M.,good to fine. 977 1957-59 2r.on 2/6d.,5r.on 5s.,10r.on 10s.,plate Ovpts.,M.,fine. 983 1864 6p. rose-carmine,wove paper,Unused block of four,four marg. 985 1866-67 2p.,5p.,2p. (B),on thin paper,M.,HR.,all four marg.,fine. 987 1869 50b. red & pale blue,Imperf.,U.,light Pmk.,four marg.,fine. 1082 1961-63 set to 1r.with add.1/2c.& 1c.shades/types,M.,HR.,fine. 1106 1961 1/2 on 1/2d.to 2r.on £1 Surch.set,UM.,2r.M.,good to fine. 1114 1858-72 50 ore deep lake,U.,light cds.,very well centred,fine. 1128 1882-99 3c. purple-brown,Granite paper,Wmk.8(impressed),M.,good. bottom-left,good to fine. N.B.may have retouch `left of spear’. 1153 1914-33 15c. purple on buff,Tete Beche pair,U.,cds.,good to fine. 1158 1923-30 40c. blue & green,chalky paper,grilled gum.U.,cds.,fine. 1173 1932 30c. grilled gum,U.,light machine Pmk., good to fine. 1192 1923 Defin.set to 20p.,add Ovpt’d with T.5,M.,HR.,top two vals. 1194 1924 1/4 green,Ovpt’d T.17,Bl.4 showing two Tete Beche pairs,up. & inv.Ovpts.,top-left stamp also showing crack to ptg.Plate,M. 1209 1918 P.O.W.,15c.on 5Fr.set(No 15c.on 35c. ),M.,HR.,good to fine. top-right corner,otherwise very good condition for this issue.